What are the differences between WhatsApp and Line? Which is better? Here is a comparison of WhatsApp and Line that will help you choose between them. In our tech ring today, we have two formidable contestants. On your left is one of the most popular messaging app in the world today. The messaging app was released on February 4th, 2009 and today, it has over 1 billion monthly active users and growing. As an instant messaging platform, it is available for both Apple iOS and Android devices. It offers end to end encryption to ensure the privacy of its users is protected. You can create groups and chat with group members on various issues. Furthermore users can share photos, GIF, video excerpts, documents, phone contacts and audio files. Ladies and gentlemen, give a shout out to WhatsApp. On your right, you have a freeware app that provides instant communication. Users are able to share images, videos, audio files and even conduct free VOIP conversations. After its launch, it attained 100 million users within the first three months and 200 million users six months later. As of January 2017, the app had 217 million monthly active users according to Statista. It started as a mobile application for Android and iOS smartphones; today it has expanded to popular platforms like Blackberry. Ladies and gentlemen, welcome Line to the tech ring. 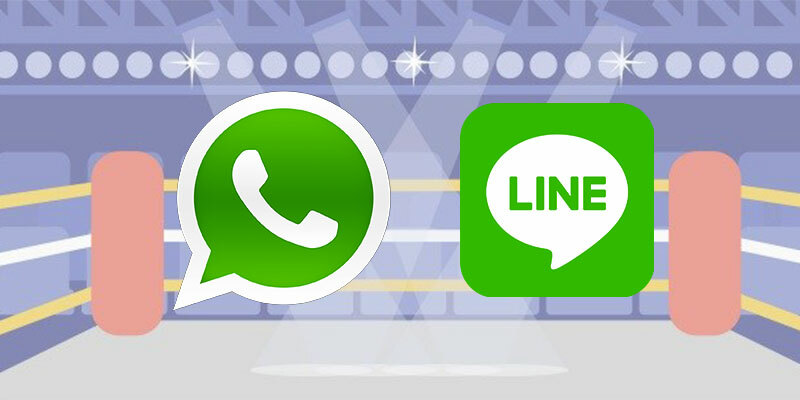 In our tech ring today, the match between WhatsApp vs. Line will play out in terms of their major differences. By the end, you will know which app is outstanding. This is one of the most important factors that users look for when downloading a messaging app for use. No user wants to learn that their chats, photos, video excerpts, GIF, audio files, documents and most importantly, contacts and messages can be intercepted. Over the past few decades when majority of messaging apps were being introduced, there were reports that intelligence services were able to intercept information from messaging apps. This sent shockwaves among users around the world. To ensure users were protected, messaging apps developers implemented end to end encryption. This feature was implemented by WhatsApp on April 5th, 2016. As a result, each and every communication transmitted between users is encrypted and made inaccessible through any means of spoofing. Line implemented the same feature on July 2016. The difference is WhatsApp implements the Signal Protocol while Line implements ECDH protocol. When coming up with an interface, developers the world over always implement easy to use controls with attractive colors and backgrounds. Problem is not every user will be able to immediately use the app. This means they have to check online tutorials to learn how to use the app and the many features it offers. If the interface is complicated, problems do escalate and the messaging app company will surely experience a decrease in users. WhatsApp adopted a very easy and appealing interface just like its parent organization, Facebook. It offers three tabs with a menu button on the right hand corner. This allows users to access additional features and settings. Line comes with four tabs featuring icons and labels. When compared to each other, WhatsApp has an easy to use interface than Line. From the word go, messaging apps were designed for sending text between users. The apps are developed to access your phonebook in order to mine contacts. These contacts are displayed on the messaging app and allow you to communicate with other users. Overtime, new features were added which extended the use of the apps. Not only are users able to share documents and media files but they can make voice and video calls too. WhatsApp has the following standard features – messaging, voice calls, security by default, group creation, video calls, photo and video sharing among others. On the other hand, Line offers free messaging, free voice calls, video calls, photo and video sharing. So, where is the difference between WhatsApp and Line? Line offers stickers which can be used to jazz up your chats, latest news and special coupons from popular brands. It also offers Shake It function for adding friends. WhatsApp recently added filters, albums and reply shortcuts. When it comes to standard features between WhatsApp and Line, be the judge? Users need to register with their details upon installation and before using WhatsApp. Details required include name and your mobile number. An SMS is usually sent to verify ownership of the phone number. Once this is done, you will have access to its features. With Line, name, mobile number and email address among other details must be provided. When it comes to accessibility, WhatsApp can be accessed from the user’s mobile phone as well as a web client. To use the web client, users have to scan a QR code and maintain their smartphone’s internet connection on at all times. Line only works on one SIM card and email address but you don’t need a SIM card to login like in WhatsApp. Users are usually anxious when communicating via messaging apps. To keep the conversation going, messaging app developers have devised a clever feature. This feature informs users if their counterpart is typing a reply. Furthermore, it helps to prevent confusion. WhatsApp has implemented this feature and it’s available on its reliable messaging platform. It can be used between individuals and groups. Line has not implemented this feature yet but hopefully, they will make an upgrade in the coming future. Now that the match has come to an end, we finally have a clear winner but before that, here are a few additional features that will solidify the decision. With WhatsApp, users know when others were last active; one can stay invisible and send a contact stamp. On the other hand, Line allows you to send free SMS, add friends through QR codes or by Shaking the phone and supports 40 languages. So, who is the winner? Definitely, WhatsApp takes the coveted prize.